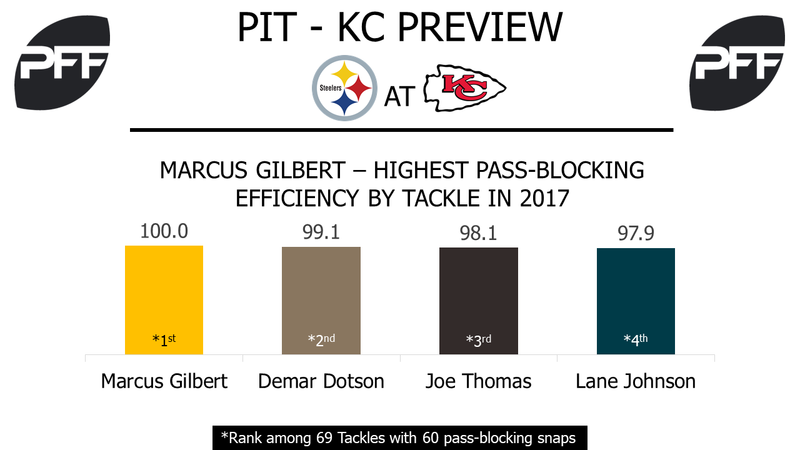 T Marcus Gilbert vs. Edge Justin Houston –The Steelers’ right tackle is still the only tackle that has played at least 60 pass-blocking snaps without allowing a pressure this season. In the three games Gilbert has missed, Chris Hubbard has allowed 12 total pressures including one sack. Gilbert’s 84.7 pass-blocking grade ranks sixth among tackles this season while Hubbard’s 47.9 is 51st. Ben Roethlisberger’s time to be sacked changed drastically between Gilbert and Hubbard starting, 3.63 seconds with Gilbert while 2.92 without. Houston will be looking to continue his hot start as he leads outside linebackers with six sacks in five games and is second with 20 defensive stops. He is also one of just two edge defenders to earn a grade of at least 75 in pass rush, run defense, and coverage in 2017. WR Martavis Bryant vs. CB Terrence Mitchell – Bryant is off to a slow return from suspension with only one catch of 20 or more yards downfield on 11 deep targets. He also has more dropped passes this season with two than he does touchdowns (1). The Steelers are hoping Bryant can step up soon to help Antonio Brown (89.6 overall), the only Steelers receiver grading higher than 60.0 overall this season. Bryant will be going against a cornerback that just allowed three receiving touchdowns to two different receivers in Week 5, Terrence Mitchell. One of those touchdowns came on a 48-yard reception by Texans speedster Will Fuller. Mitchell’s 414 receiving yards allowed in coverage this season are the most by any cornerback, boding well for Bryant. HB Le’Veon Bell vs. S Daniel Sorenson – Bell only rushed the ball 15 times in the Steelers’ Week 5 matchup against the Jaguars but reeled in 10 receptions. However, Bell’s struggles to make the most of those receptions continue. He has run the most snaps in route by a running back this season with 169, on pace for 540 which would be the most-ever recorded by PFF for a running back. But Bell’s 0.85 yards per route run are the sixth-fewest in the league by a running back targeted at least 10 times in 2017. Sorenson, the Chiefs’ hybrid linebacker-safety chess piece, has lined up in 20 different positions throughout the field this season. But his 118.8 passer rating allowed when covering running back’s running receiver routes is the second-worst on the team. 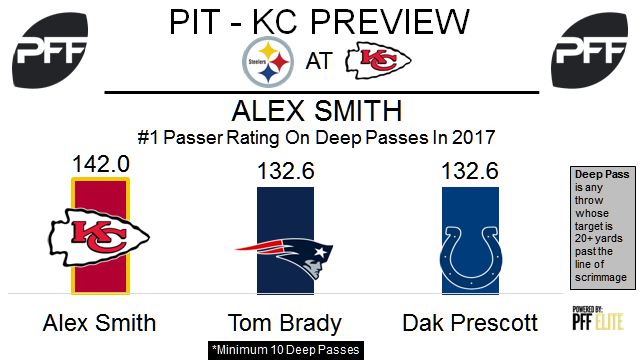 QB Alex Smith vs. S Mike Mitchell – Kansas City scored a total of 30 points in two games against Pittsburgh last season, but this is a different Chiefs offense. Smith is the second ranked quarterback in the NFL through Week 5 with a career high 89.0 PFF grade. He has been much more aggressive this year, leading all quarterbacks with a 57.9% adjusted completion percentage on deep passes (targets 20 or more yards downfield) and a 142.0 passer rating on deep throws. Smith will try to move the veteran Mitchell with his eyes. He is currently ranked 41st of 84 qualifying safeties with a 75.6 PFF grade. Mitchell has been targeted five times in 99 snaps in coverage and has allowed two catches for 33 yards. HB Kareem Hunt vs. LB Ryan Shazier – Hunt has exploded on the scene as a rookie, leading all running backs with a 93.4 overall PFF grade, the third-highest grade of any NFL player this year. He ranks second among running backs with 50 or more touches this season in PFF elusive rating at 104.8 (a runner’s success beyond the point of being helped by his blockers). Shazier has the speed to matchup with almost any back in NFL. His 87.9 overall PFF grade this season is third among all linebackers. Shazier has been targeted 24 times in coverage and allowed 20 receptions for 201 yards with two interceptions. T Eric Fisher vs Edge T.J. Watt – In 2017, Fisher has allowed one sack and 10 total pressures in 187 pass block snaps. He’s ranked 17th of 69 offensive tackles in PFF pass blocking efficiency (pressure allowed on a per-snap basis with weighting toward sacks). Watt got off to a hot start this season with two sacks in his first NFL game. After suffering a groin injury in Week 2 he has slowed a bit, totaling three sacks and only five pressures in 67 pass-rush snaps for the year.